Here's your chance to own it all with the world's most popular board game. 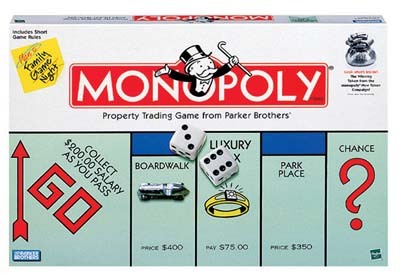 Since 1935, the MONOPOLY game has been bringing families together to buy, sell and build in PARKER BROTHERS Property Trading Game. Whether you're creating new cherished memories or rekindling your youth -- the MONOPOLY game is the classic favorite. Classic game, this one should be on everyone's shelf, good stepping stone to get your kids playing games. Always a family favorite. Collect properties and make money when your competitors land on your properties. So many hours were spent playing Monopoly when I was a kid. This is the classic game. For a game to be this popular and the number of themed versions that this has it must be fun. The people that I play with make a game fun for me, and that is no exception for Monopoly. The good thing about this game is that it is so well known that everyone feels comfortable playing it. I recommend reading the rules again, even if you think you know the game - I had missed a rule and the game was much better with it. Classic! Easy to learn but difficult to master. Anyone can play and helps teach younger children to count money and to manage resources. The classic board game. This game is probably the one that most people think of when they think of the typical board game. Strangely enough, although it's well known, many people don't know the real rules of the game. Many families play with their own house rules, so you may be playing with house rules and not even know it! Things like getting money for free parking, and having to go around the board once before you can buy are not actually part of the rules. And most people don't play with the most important rule: properties that are not purchased by the person landing on them are auctioned off to the highest bidder. I find that this rule makes the game much richer and more rewarding.